Students - I am a saver of things. Especially things that make me remember good times. So sometimes, around my house, I will find a tiny pajama shirt or a wee dress. Do these fit my children now? No! But I keep them, and I remember. Today's poem is about such little clothes, about the passage of time, and how mysterious that is. It's another wondering poem, a wondering into the future poem, written in quatrains. What do you wonder about the future? You might wish to keep a little list in your notebook...that future-wonder might grow into a future-poem! Today I am thrilled to welcome twin brother poets, their mother, and their teachers. It is a true honor to host this party of people who love words and writing and life. 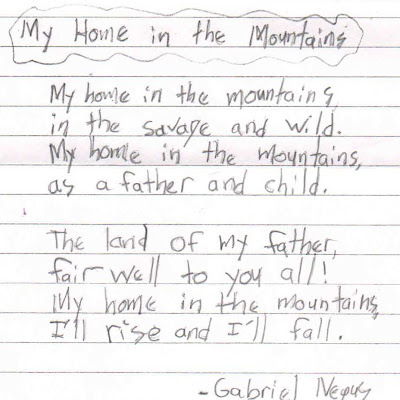 Read on and please welcome poets Gaelen and Gabriel Negus. You will first hear from Gabriel's teacher, then Gabriel, then Gaelen's teacher, then Gaelen. Your final peek into these writers' lives will be through the words of their mom. Greetings to Gaelen and Gabriel, Mrs. Negus, and Iroquois Intermediate fifth grade teachers Kristen Domino and Joe Long! Writer’s Workshop in our classroom is a comfortable place where much instruction, conferring and sharing take place daily. Students are very eager to share their pieces with their classmates and take pride in all that they create. 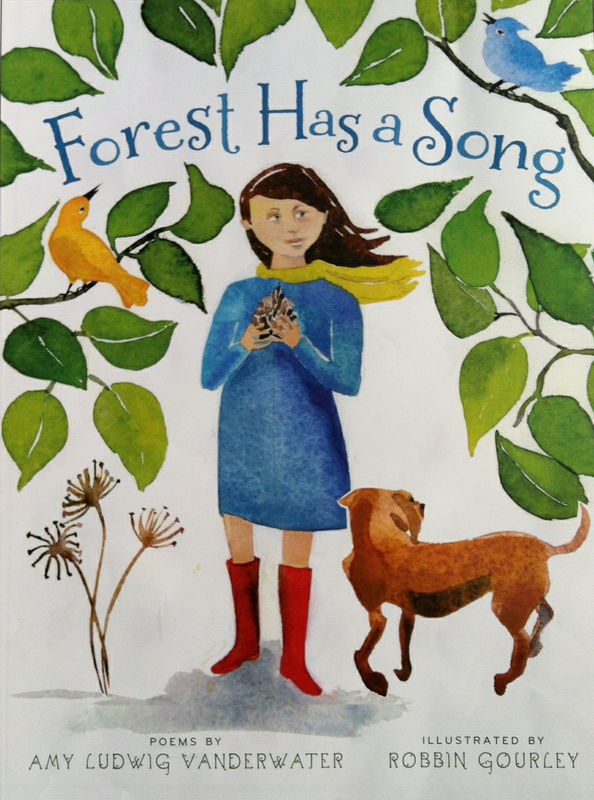 We begin each Writer’s Workshop with a chosen poem or an excerpt from a mentor text that either I picked or the students have found. This will lead us into our mini-lesson of the day, or some days we go right into students' current work. When our writers hear “Ricardo” our writing friend (a wooden frog noise maker) croak, that signals it is time to share what they have worked on that day. Students can stand at their seats or sit on our writer’s stool to share the pieces they started. 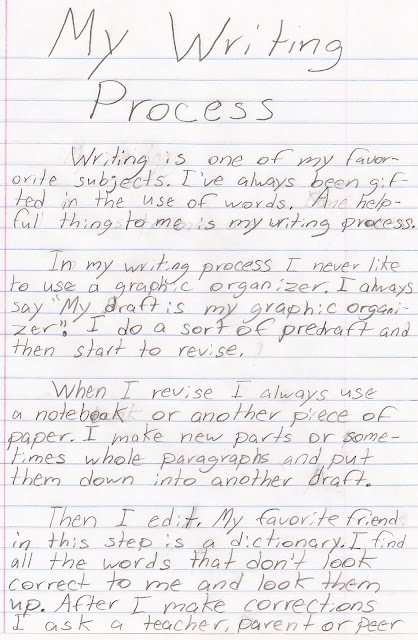 Many students choose to take their writing home with them to continue working on, as it is not seen as an assignment, but more of a part of them. Our celebrations are also very exciting as the students receive a bound, published book with all the pieces that each student creates for that assignment! Their faces light up when they see their classmates read their pieces for enjoyment! My goal during Writers’ Workshop is to create an “event”. We begin each session the same way. Students prepare materials and meet at our carpet area when they hear three bells. 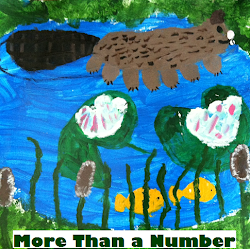 Depending on the unit, I immerse students with chosen mentor texts, which include my own writing. 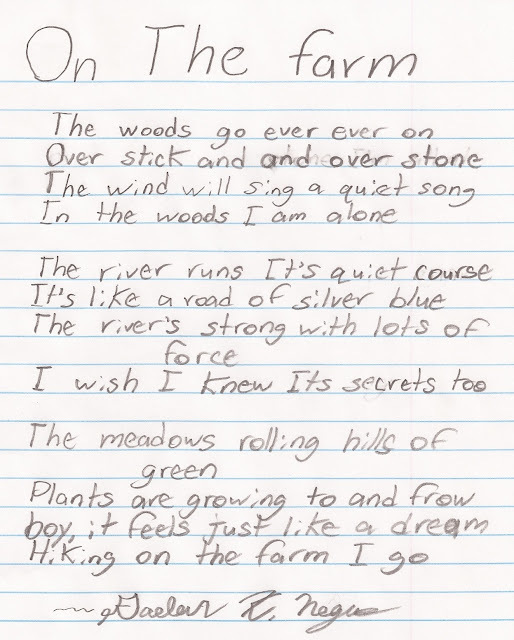 For our poetry unit, I read daily poems from several sources. 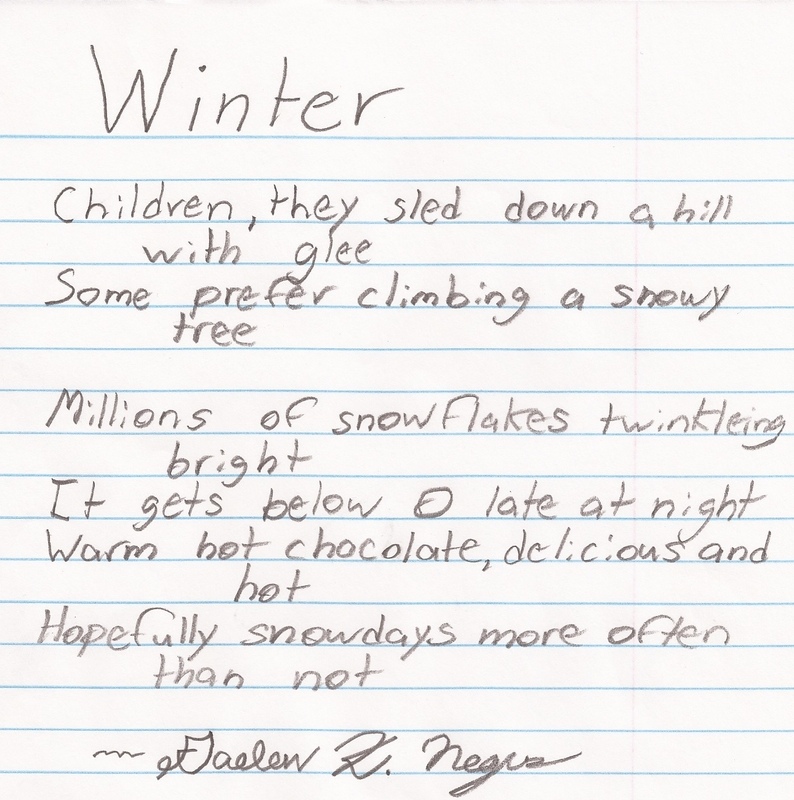 We share poems that students collect from outside the classroom as well. My students enjoyed discussing the various authors’ crafts that we discovered. Students especially enjoy discussing and emulating the imagery used by their favorite poets. 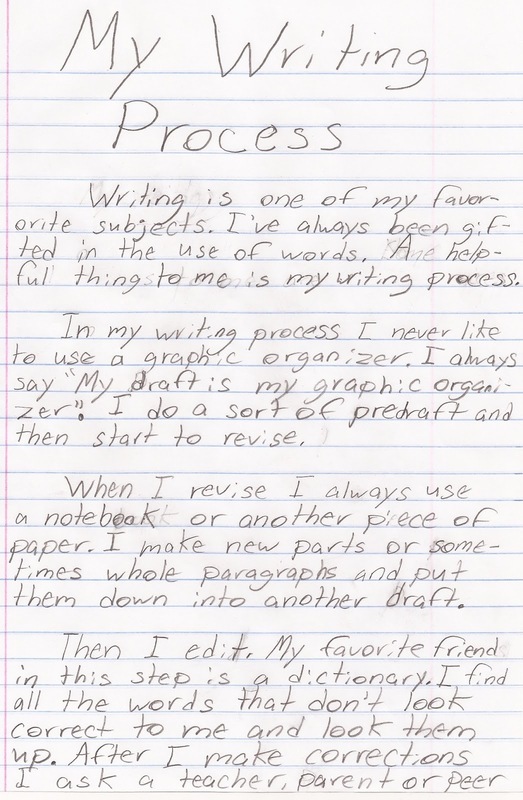 To engage my students in their daily writing sessions, I utilize a number of techniques. I store a collection of words written in marker on index cards. I choose a word, hold up to the students and have them write as many things as they can think of when they see the word (at least ten). They have three minutes to write a list of connecting thoughts. When three minutes have ended, students then choose one thing from their list to write about. Again, students may choose topics according to their inspiration or unit we may be exploring. Choosing to share personal writing is a brave act. I allow students to share their work in two ways. Students may read their work orally to inspire others, but all work is read in our second celebration. As a whole group, we place our work out on our desks, inside a personally crafted portfolio. As music penetrates the room, students walk around the classroom and read all published pieces. Post-It Notes are used to leave the authors positive comments following a read. Students are asked to note what inspired them from the works they read. Gaelen and Gabriel were born with an amazing natural creativity! They love to read, as they have always seen how much Daddy and Grandpa Negus love reading everything from our nation's history to fantasy literature. Especially influential have been the writings of J.R.R. Tolkien: the boys love his poetry and fun riddles. They just write about the fun things we do...camping, activities of the farm, fun outdoors. They watch minimal TV, but listen to a great variety of music. Their early faith in God affects their writing so much, lending the perspective that life holds great meaning in the hands of our loving creator. I feel that I have a lot to learn about writing from these two boys, about teaching from their teachers, and about parenting from their mother and father and grandfather. Gaelen and Gabriel, thank you so much for sharing your words and spirits with us today. And many thanks to Kristen Domino, Joe Long, and Mrs. Negus. What a delight! 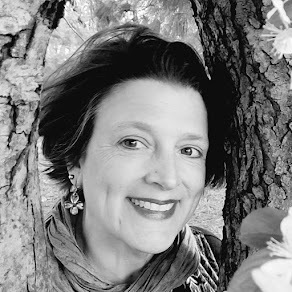 This week at The Poem Farm's sister blog, Sharing Our Notebooks, you can peek into the many notebooks of author Kami Kinard. She's offering a lovely red journal as a giveaway as well. 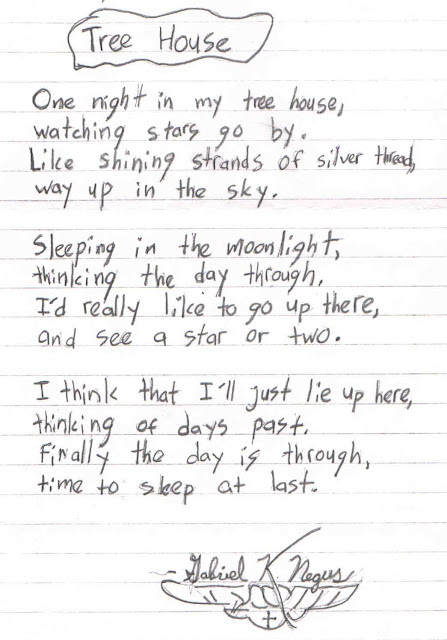 All of those poems are wonderful. So cute to see the handwriting of the young ones with such eloquent poetry. 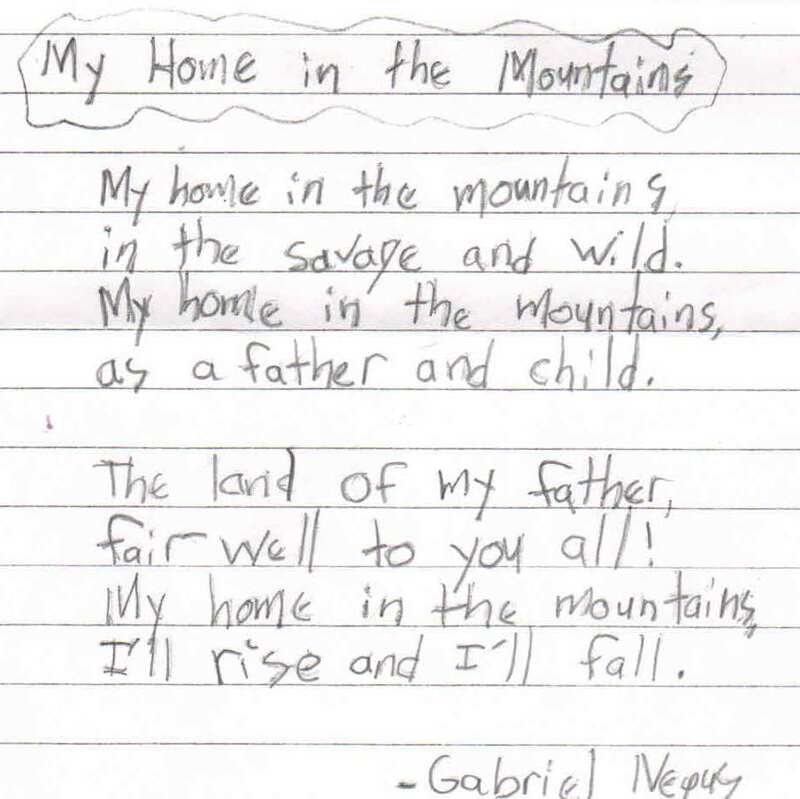 Love this post -- Gaelen and Gabriel are such gifted writers! Liked reading about their processes, too :). 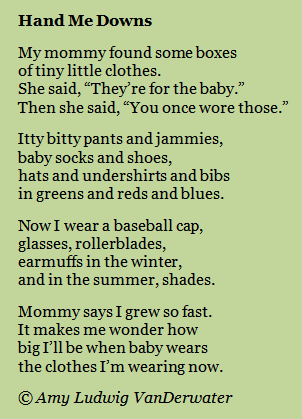 Adorable pic of your children, Amy; very sweet poem about the little clothes :). So much to savor in this post! Adorable photograph of your kiddos,too. Thank you for sharing the student notes on the writing process - here are writers who truly know and delight in the process. How wonderful! Oh my, it is wonderful to hear from these young writers, and their teachers and mother. What gifts they all have, Amy. I loved the poems, but even more about each of the stories about the process. Everyone talks a lot about choice, so important. And love that you have some few things 'saved' too from your childen's younger time. I have a certain little red dress, and so on. Happy Mother's Day! Cheers to Gaelen and Gabriel, and to the wonderful adults in their lives who encourage such creativity! 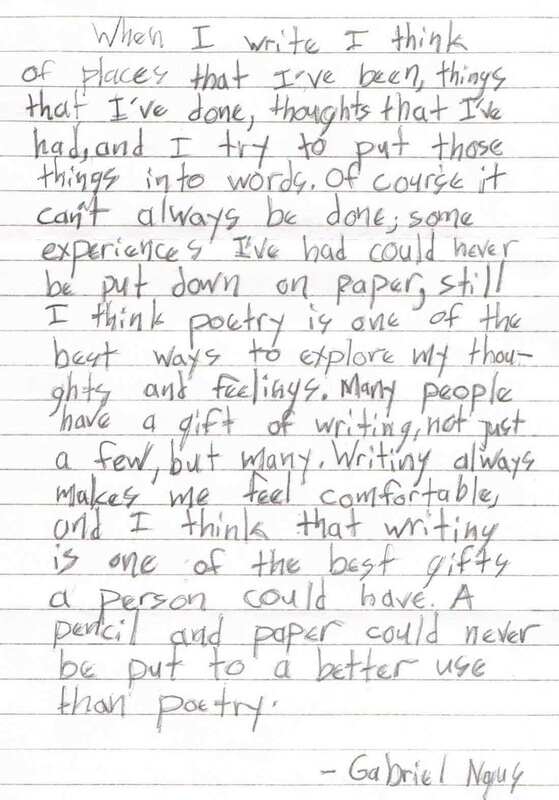 I loved reading their very articulate comments about their writing processes, and the terrific poems. Thanks to all of you for sharing. 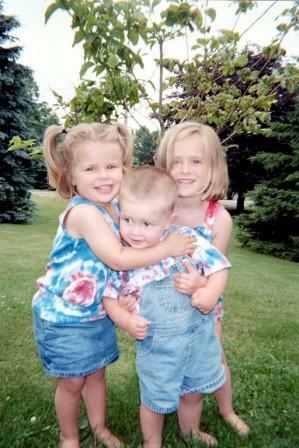 (And that is a quite adorable pic of your kids - I still have little clothes saved around here, too, and my early efforts at sewing some of them!) Happy Mother's Day. Wow! 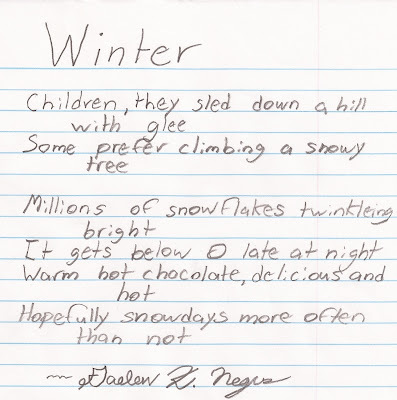 Terrific poems! 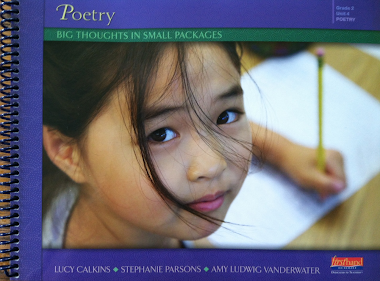 And wonderful poetry processes in the classroom. Hooray for these poets and teachers. I love when Gabriel says "not just a few, but many." Amen! 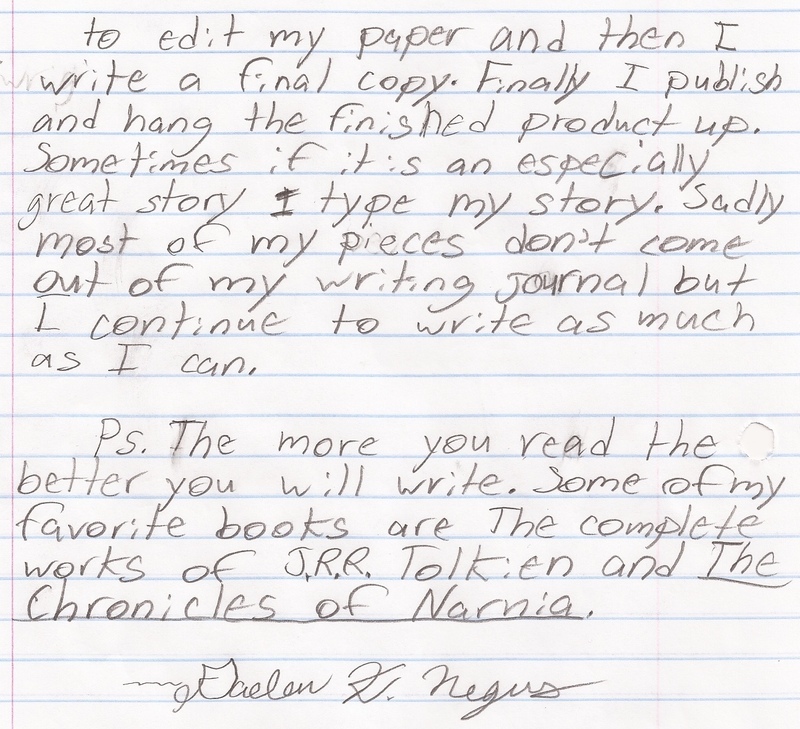 And Tolkien came to mind as I read both brothers' work, so it was fun to see that he's one of Gaelen's favorites! Amazing post, Amy. I loved reading the poems by your guest poets. The quiet tone that Gabriel creates with his imagery is so beautiful. 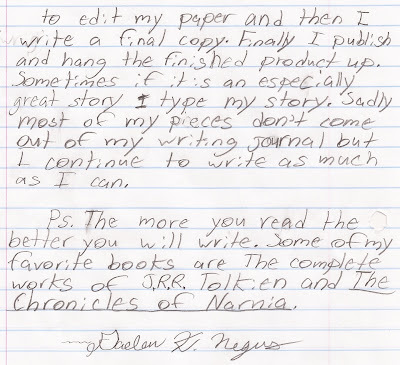 I agree with Gaelen, "The more you read the better you will write." 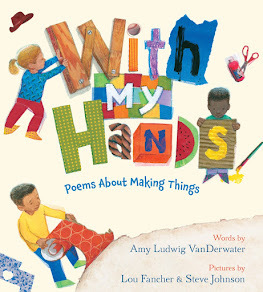 Amy, your poem made me think of sitting with my mom looking at the baby clothes of mine that she saved. It pained her to donate ANYTHING to the resale shop! We definitely saved all of the clothes she had sewed for me. When did she ever have TIME??? And to Gabriel and Gaelen -- WOW! I'd love to have you in my class! It's writers like you who lift the whole workshop up to another level. Thanks for sharing Gabriel's and Galeen's writing processes, along with their parents and teachers. There is a lot to be learned here. What talent they have! Wow. What a great post. This was such fun to read. So wonderful to read the poetry these boys have written. I enjoyed hearing about their writing process, too. Thanks for sharing. I'm so proud of the twins as well as their teacher!!! !